32 teams officially back at it. Training camp is in session and the NFL is back on our mind. The readers of LynchyRightNow are clamoring for The League and Sunday afternoons. All due respect to the MLB trading deadline and all things NBA summer league but I agree with the readers . . . What?!? You didn't enjoy the life and crimes of Plaxico, Pacman, Vick, and Stallworth?!?! Back to the field. Two games I've circled on my calender for September. (1) Week 1, September 14th. All eyes on Monday Night Football and the Buffalo Bills in Foxborough, MA. Say what you want about Terrell Owens but he can make even Buffalo sound exciting. Coupled with the full return of All-World quarterback Tom Brady, and we've got ourselves a show. No team in the NFL has done more to improve themselves than the New England Patriots. Adding veterans like Greg Lewis, Joey Galloway, and Fred Taylor on offense the Patriots are giving Tom Brady plenty of capable weapons around him. As for the Bills, don't count them out. Buffalo is the ultimate wild card. Adding talents like T.O. and Dominic Rhodes the Bills could give Trent Edwards a fantastic offense around him. Bills v. Patriots on MNF, doesn't get better than that to open the season up. (2) Week 2, September 20th. Sunday Night Football live at the home opener of America's Team. As the Dallas Cowboys unveil Cowboys Stadium to the world and welcome the division rival Giants the NFL season officially gets under way. As a Cowboy fan I may be bias . . . . yep, I'm bias. This is the first regular season game in Cowboys Stadium. Eli Manning v. Tony Romo. If you can't get up for Giants & Cowboys, I suggest Cialis. The Giants layed an egg in the 2008 playoffs and the Cowboys are hoping that the departure of "the wideout that shall not be named in conjunction with this franchise" will bolster an offense that promised us playoff wins. If we've learned anything from Jerry Jones this night doesn't go by without some fireworks, both on the field and off. I've thought about this believe it or not. Right from your neck of the woods, Big Ten country, comes Beanie Wells. The defending NFC Champion Cardinals drafted right at #31. However, the success of Beanie Wells depends on his ability to stay healthy. Wells whose suffered injuries late in his Ohio State career needs to stay on the field to be the breakout rookie the Cardinals need. The running game is exactly what the Cardinals need to stay atop the NFC West. With Larry Fitzgerald and Anquan Boldin returning for yet another year the Cardinals offense is set to make the same run. Chris Wells adds a running style the Cardinals have lacked. A power runner who can open holes and keep the defense honest with the big wide outs sprinting down the field. What the Cardinals have lacked in their running game with Edgerrin James and Tim Hightower, Chris Wells can deliver. The '07 & '08 collegiate 1,000 rusher is a 240 lb. back who can storm the NFL if he stays on the field. That might be a big IF. Same team, same title. Ugh, the Philadelphia Eagles. As much as it pains me to name an NFC East foe as the Super Bowl favorite, I buy it. Giving Brian Westbrook help in the backfield in the form of rookie Pittsburgh back, LeSean McCoy. Hoping to duplicate their 2008 draft success of DeSean Jackson, the Eagles select Missouri speed man Jeremy Maclin. 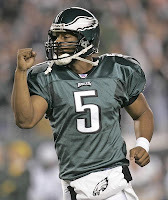 Donovan McNabb happy yet? Despite the injury to linebacker Stewart Bradley the Eagles will be playing defense with more hunger than ever given the death of legendary defensive coordinator Jim Johnson. If any team knows what they are doing, it's the Eagles. Mainstays such as Lito Shepperd and Brian Dawkins are out but in comes former Patriot Ellis Hobbs to join his former teammate, Asante Samuel. The left tackle Jason Peters from Buffalo arrived in Philly via trade to further improve that offense. I'm of the opinion that till the Eagles are buried, they're never dead and you should be too. Just when you think Donovan is about to let you down, he shocks you. So no, I'm not going against Philly, ever again. What star is approaching NFL MVP caliber? Will there be any surprises in 2009? - Rich, L.A.
One answer: Phil Rivers. Coming off his best season of his career Phil Rivers has smashed his way through. In 2008 the San Diego quarterback threw for over 4,000 yards and 34 touchdowns. The San Diego Chargers have one of the toughest quarterbacks in the league who has finally matured. Past Brady & P. Manning, it'd be hard to argue that Phillip Rivers isn't the leagues next best quarterback. The Charger offense that Rivers leads was one of the most efficient through the 2008 season. At just the 25th ranked team in passes attempted, Phil Rivers & Co. ranked 7th in yards per game. Tied for 5th in fewest interceptions and tops in quarterback rating. If there was ever a year to catch people sleeping it'd be 2009. With the quick rise of the Kansas City Chiefs and a new coach at the helm in Denver, San Diego suddenly becomes the least interesting story in the AFC West. Just what the doctor order for Phillip Rivers. I expect big things from the Charger quarterback in 2009, so should you. Don't look now bout the NFL season is fast approaching and with the majority of baseball cities out of it, that means you Baltimore, Kansas City, and Cleveland, I have just one question for you . . .Are you ready for some football?